A college tin sign that advertises for a fictional service? Now that's whacky! And, it's perfect for your college decor. 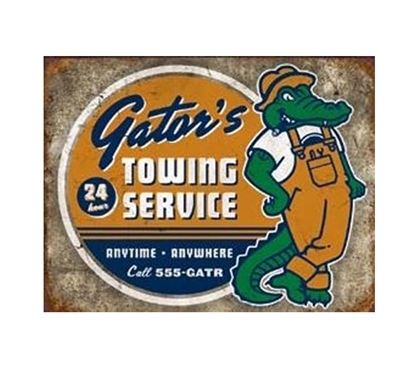 Tin signs for dorms like this Gator's Towing Service Tin Sign are great college supplies for the purpose of making your living space your own living space. By that we mean, they're the perfect college supplies for personalizing your dorm room and making your dorm decor reflect your personality. Your dorm wall decor is where your personality can shine. So be on the look out for more than just college college decorations, and choose some that are fun dorm stuff and maybe even a bit whacky.